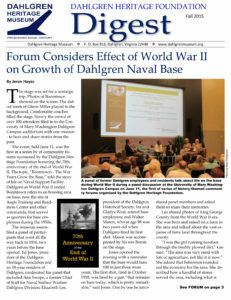 Members of the Dahlgren community gathered Oct. 16 at the University of Mary Washington Dahlgren Campus to celebrate the installation’s 95th anniversary. The festive occasion, sponsored by the Dahlgren Heritage Foundation, brought together service members, community leaders and employees past and present. “Thank you so much for being here for this very special occasion, the commemorative celebration of the 95th anniversary of the Navy base now known as Naval Support Facility Dahlgren,” said Ed Jones, president of the Dahlgren Heritage Foundation, welcoming attendees. Dahlgren was a remote piece of marshland in rural King George County before the Navy fired its first test shot at the new base in the fall of 1918. Though the nature of the work at Dahlgren has evolved during its more than nine decades of existence, the base continues to be called “a crown jewel of national defense,” said Jones. Marines supervised by Navy Lt. Cmdr. H.K. Lewis fired that first shot from a tractor-mounted, 7-inch, 45-caliber naval gun, hurling a 153-pound projectile 24,000 yards down the Potomac. The restored gun was on display this week at Dahlgren’s parade field. Capt. Pete Nette, commanding officer of Naval Support Activity South Potomac, praised the Dahlgren Heritage Foundation for making the celebration possible and the thanked University of Mary Washington Dahlgren Campus for hosting the event. The leader of Dahlgren’s largest tenant command shared some behind-the scenes insight about the effort to name the base. “It’s the policy of the Department of Defense to name a proving ground after the geographic location it goes in, not to name it after a person,” said Capt. Michael Smith, commanding officer of NSWCDD. Two leaders from that community, Del. Margaret Ransone and state Sen. Richard Stuart, discussed the installation’s history and future. The base also serves as a vital employer in the area. “[Dahlgren] is such a tremendous asset to this region,” said Stuart. Ransone read a proclamation from Governor Bob McDonnell declaring Oct. 16, 2013 Dahlgren Day, in recognition of the installation’s contributions to both the national defense and the commonwealth of Virginia. Ransone presented each commanding officer at Dahlgren’s commands with copies of the proclamation. The guest speaker at the anniversary ceremony is no stranger to Dahlgren. Rear Adm. Brad Hicks (Ret.) commanded Navy Air and Missile Defense Command and was the program director for Aegis Ballistic Missile Defense at Dahlgren prior to his retirement from the Navy in 2009. During his tour, he led the mission that successfully shot down a damaged satellite threatening an uncontrolled reentry into the earth’s atmosphere. Hicks is currently a vice president at Lockheed Martin. When Dahlgren increased its output for World War II, anti-aircraft proximity fuses helped win the war. “Those algorithms, those mathematical models were envisioned here at Dahlgren,” said Hicks. Hicks said the colocation of many Navy commands at Dahlgren is a major factor in the installation’s continued success, a situation set in motion by the late Rear Adm. Wayne Meyer, “father” of the Aegis Combat System. Colocation allowed engineers to work closely with the officers and Sailors that would maintain and use Aegis. “We had learned painfully that as weapons systems got more complex, if you didn’t do that, you might not get it right,” said Hicks. That kind of foresight and perseverance is Dahlgren’s way forward. “When you look at the innovation that’s come out this lab, it has survived good times and bad times,” said Hicks.